Learn about the technique we use to make our website load fast! 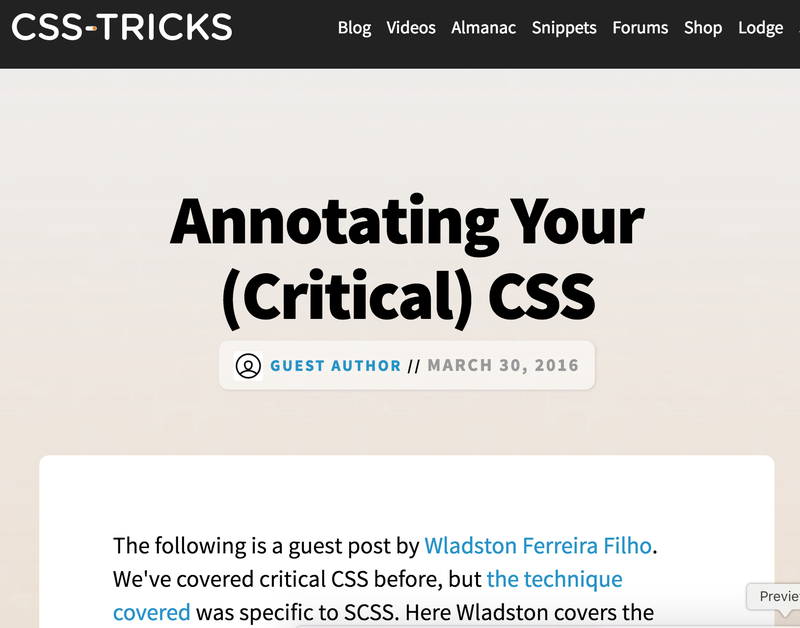 I’ve had the honor to publish a guest post on CSS-Tricks, one of my favourite blogs. This blog has always been on my read list, and has helped solve tricky web problems many times. My post there is tailored for web coders. It shows how to improve your CSS code by using a technique called Critical CSS. It really speeds up the page load time on websites. Without further ado, if you are a web developer and you are not taking advantage of Critical CSS yet, check out the post here: https://css-tricks.com/annotating-critical-css/ leave your comments there, I’ll reply em all! Hi Korman! Thanks for your comment. I think those services that generate the critical CSS automatically are great! The problem is that they aren’t perfect. I think it’s OK to use them to generate a first critical/non-critical pair. Then you can edit them to smoothen rough edges. Modern browsers allow simulating a very slow internet connection. We can use that to test and perfect the experience of loading the web page on a slow connection. Thanks for the clarifications, it was very useful!